Last week I announced the release of our new Belize island video. If you haven’t watched it yet, I hope you will. 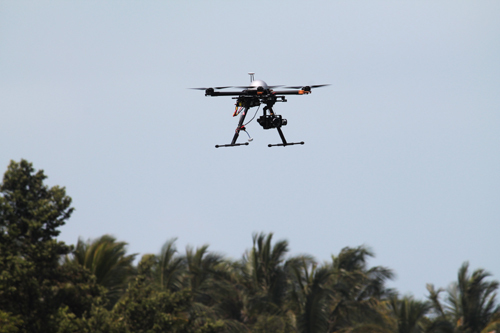 Much of the footage was filmed from a drone, operated by photographer Jason Lee, aka “Sky Pirate”. This was incredibly exciting for us to have this new-fangled contraption buzzing above our heads, and the guests on the island were incredibly patient and supportive while we filmed their every move. 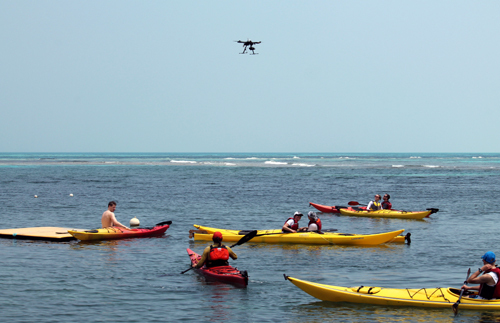 The Belizeans especially were enthralled with the drone, it was thrilling. Sky Pirate on the island! Jason got to work right away, and that first afternoon filmed the island itself from the air, this is the main footage seen in the new video. 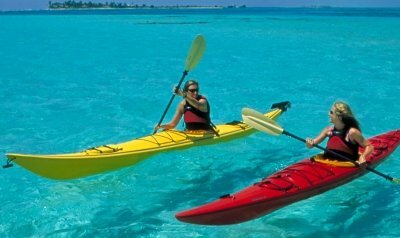 You can also see this shot on our Belize island Facebook page. The next day during the sea kayak orientation, our kitesurf instructors Jasmine Ardeshiri and Alex Hamel paddled SUPs in our lagoon while the orientation was going on. He got lots of great footage then, which also appears in the video. Jasmine and Alex paddle for the drone. Our guests were great as this noisy mosquito-like creature buzzed above their heads during sea kayak orientation. The next day, we got some great surf footage, which is the highlight of the video. All of our surf shots are almost always land-locked with their point of view, because it is very hard to take pictures of people surfing while you are IN the surf yourself. Not anymore! 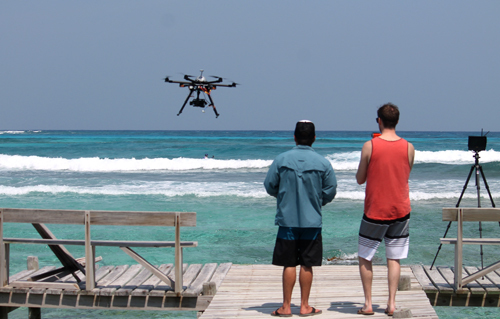 Jason lands the drone after a surf-filming session. 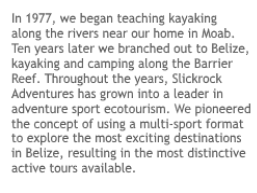 But the true highlight was simply the staff’s excitement over the drone. 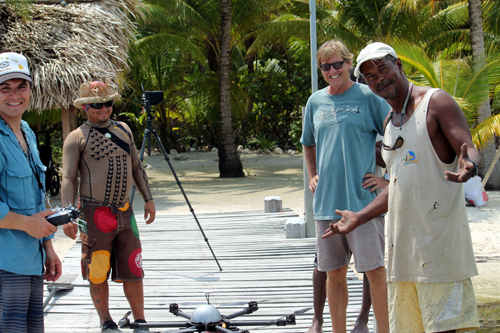 Here Jason, Carlos Guerra (our island guide), Jim Schofield (the owner of the dive shop on the island), and Junior (the dive shop boat captain and a life-long resident of Long Caye) marvel at the drone. Jason, Carlos, Jim, and Junior with the drone.